TeamsID enables you to make sharing passwords easy and safe for everyone in your business or organization. TeamsID provides a flexible and powerful way to make sure all the right people have access to all those bits of information -- passwords, account numbers, codes, or other sensitive records -- that they need to get things done. If someone makes a change to a password or other record, it’s automatically shared with others who need it. With TeamsID, everyone is up to date and there is no need to send bits and pieces of confidential information like passwords over email, IM, or voice mail. Getting started is easy - create an organization, set up appropriate teams, and then invite members into those teams. Then, anyone in a team can start creating records and making them available to others. You can also create confidential records that only you have access to. With everyone using TeamsID, your organization is more secure, team members spend less time looking for information, and everyone gets more work done. Have been using TeamsID since more than a year now. Has increase productivity for us at office along with security for our passwords and data. The Mac app is made life even more easy now and the UI is fantastic and easy to use. 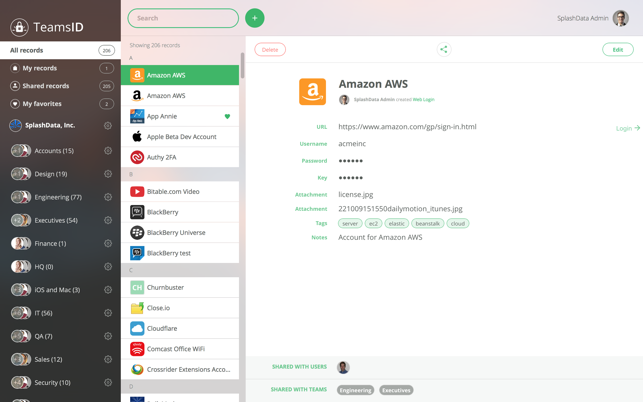 If you have a remote or distributed team, you need an app like this to organize, manage and share passwords and other records. The version 2.0 contains some nifty improvements - works faster and better usability. I use TeamsID to manage everything. It keeps me focused on my work, instead of looking for passwords, doing resets, etc. Mac app does it's job really well - quick lookup anything I need.